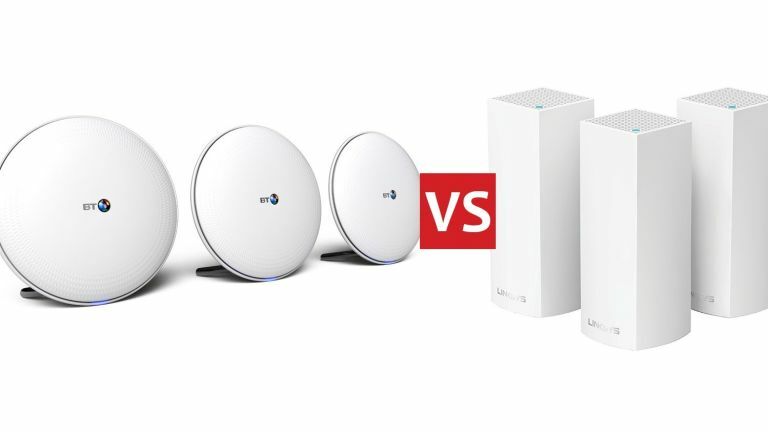 Stonking whole home mesh Wi-Fi — but which do we prefer? Home mesh networks are growing in popularity. These augment your existing router set up and provide seamless Wi-Fi across your whole home and probably your garden too. They're meant for those of us with especially large homes, several outbuildings or extremities (like a conservatory or attic room) where conventional Wi-Fi struggles to reach. Each of these packs has three units in - one base station to plug into your router and another two satellites. You can buy extras, but you'd need to have a very large home for that to be worthwhile. Both the BT and Linksys packs have iOS and Android apps for easy setup and administration. While the Linksys features tri-band Wi-Fi, BT sticks to dual-band wireless, more than most of us need, anyway. You can also plug wired devices into each 'node'. Netgear's Orbi is already a firm favourite of the T3.com crew, so how do these new challengers stack up - let's find out! Linksys Velop: Mesh Wi-Fi systems are new, designed to eliminate deadspots and bring about complete home Wi-Fi coverage. But they come at a price and the Linksys Velop is quite expensive, but it is also available in a one pack for £200 (not too useful on its own) or two pack for £350. BT Whole Home: Mesh systems are designed for truly large homes and many of us will be able to make do with a more powerful standard router like BT’s own Smart Hub. Still, for significantly less money these BT units represent good value, and they work with all broadband providers not just BT. Linksys Velop: Each Velop node is a vertical block that could easily slot into a bookshelf or on top of a cupboard and the power – and any Ethernet leads - connect to the base. It’s important these devices are reasonably aesthetically pleasing because they will often be used in family parts of the home. BT Whole Home: Instead of Linksys’ ‘tower’ design, BT has plumped for discs, each atop a metal stand. They’re not ugly like some networking units, but they’re hardly attractive and you do need a reasonably big flat surface to stick them on (they’re 16.5cm in diameter). Like BT’s routers, each disc has a pull-out tab that shows you the Wi-Fi connection details. Linksys Velop: Both of the systems on this page are designed to be very simple to use and configurable via an app. They’re not designed for those who like to tweak every aspect of their Wi-Fi’s performance. The Velop system is very easy to configure initially and – due to the app – no issue to manage on an ongoing basis. BT Whole Home: The Whole Home system is configurable via the app or you can log onto the web browser-based configuration interface and pretty much self-configures. One clever feature is that you can pause your Wi-Fi at the touch of a button – say if you were leaving your home for a couple of days. You don’t have to deal with each device individually. Linksys Velop: With three nodes, the Velop easily blankets a large home with great Wi-Fi signal – we had no problems connecting up devices throughout a large four bedroom home and throughput remained strong. We were able to use one Velop to connect our TV and YouView box to Wi-Fi thanks to the dual Ethernet connectivity. BT Whole Home: With three in a pack, you’d need to have a very large (or tall) home before you ran out of connectivity. Signal remains very strong throughout and you could easily use it to stretch signal to an outbuilding or garage with clever placement (you’ll be helped with this during setup). Linksys Velop: While the Velop’s performance can’t be questioned, its price point can be – other options, not least the BT Whole Home – are available for significantly less. BT Whole Home: For the money, it’s hard to ignore the BT Whole Home. Not only does it almost set itself up, but connectivity is fast and true.